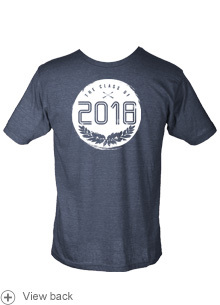 This shirt features The Class of 2018 on the front, and Corrie ten Boom's inspiring quote "Never be afraid to trust an unknown future to a known God" on the back. From Denise of Ragley, Louisiana on 8/5/2018 . From Anonymous of Sassaquin , Massachusetts on 6/12/2018 . From Anonymous of Pine Knoll Shores , North Carolina on 3/26/2018 . From Anonymous of Kamiah, Idaho on 3/4/2018 . From Mary Van Slyke of West River , Maryland on 12/11/2017 . From Anonymous of Everett, Washington on 7/19/2017 .